Set the perfect table for family or friends to gather for the holidays. This is a great way to entertain for Thanksgiving or any day of the week! Okay, we've been friends a while...or maybe you are new here, welcome! Paper products on Thanksgiving. No fancy glass dishes for this girl. No one wants all that clean up. But there are fancy dishes that are disposable too! I received fabulous pieces from Oriental Trading Company to put this tablescape together. Oriental Trading is party central. They have everything you could possibly need! I spray painted these ceramic pumpkins gold! They are perfect for Halloween and Thanksgiving or any Harvest holiday! Quick bit of paint and they look stunning! 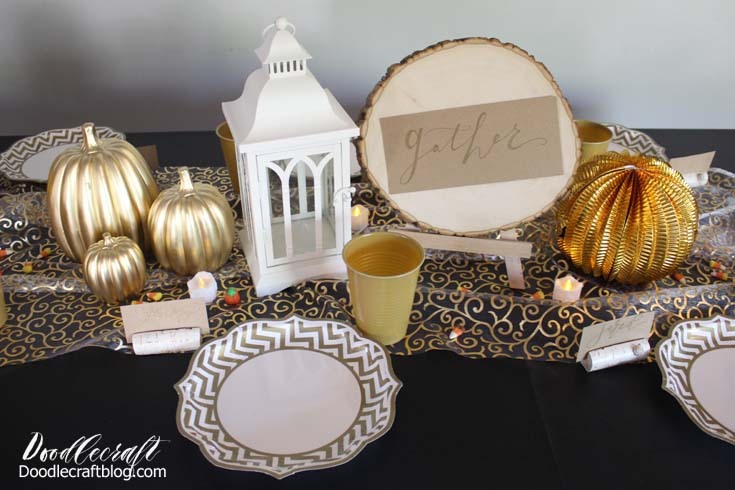 Then add candy corn and pumpkins as table scatter! I love the gold and white together! The tea lights are a perfect touch! I used kraft paper and a gold pen for the place settings and the "gather" sign for the wood slice. The best part is that nearly everything is reusable! I can use the lantern for any holiday since it's white, I can use the table covers for any occasion. The birch branch card holders are so cute and perfect for daily place settings! And enjoy the beauty of easy clean up! Oriental Trading has gorgeous plates, dessert plates, cups, napkins and cutlery! Check out the Halloween tablescape I did with similar items! And stay tuned for the Christmas tablescape!